WhatsApp is one of the most well-known and most utilized cross-platform chat applications available today. It's free for one year, and only $0.99 a year after, which is chump change when you realize there are no hidden costs like international charges. Basically, it creates an easy to use forum for you and your friends to chat, regardless if they're an Android or iPhone user. Unfortunately, tablets don't support the application, but that barrier can always be broken. Previously, we showed you how to install WhatsApp on a rooted Nexus 7, but it's a pretty complicated procedure, and if you're not rooted, even more complicated. Lucky for you, there is another way without rooting, and I'm going to show you how it's done. Please note that this method will not let you sync WhatsApp between your Nexus 7 and other device. You can only have one WhatsApp account per device. I'm not sure why, but that's the way it is. If you want to sync accounts between devices, you'll have to try out the root method instead. Before going any further, let's see which activation method you'd prefer. There are two ways to go about this after you install it on the Nexus 7 tablet. Using your own phone number to receive the activation code. This is recommended if you plan on only using WhatsApp on your tablet—not your phone. Downloading textPlus, which will generate a phone number for your tablet where you can receive a text with your activation code. If this is what you're planning on doing, check out our softModder guide to using textPlus on the Nexus 7 tablet for information on making free calls and texts. Depending on which activation method you plan on using, you will need the following. Either a phone that doesn't have WhatsApp on it, so you can receive the activation code, or textPlus installed on your tablet. The official WhatsApp APK downloaded onto your Nexus. After you've successfully downloaded the APK from the link above, you'll need to enable the Unknown sources option on your tablet, which allows installation of apps from sources other than the Google Play Store. To do so, go to Settings -> Security -> check Unknown sources. 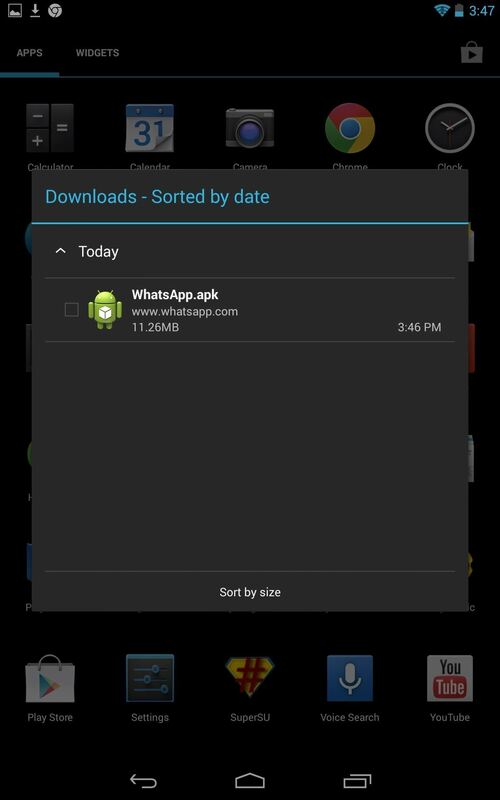 Now that that's out of the way, head into your Downloads and locate the WhatsApp APK. Tap on it, then hit Install, then hit Done (we'll open the app later). That's it for installation! You should be able to locate the app icon in your applications folder now. As previously stated, you can use your phone number to receive the WhatsApp activation code, but only if you are not already running it on that same phone. The alternative is using textPlus on your tablet to generate a phone number where you can then receive the activation code. This means you'll be able to use WhatsApp on both your tablet and smartphone, only they'll be separate accounts and won't be synced. Install and set up textPlus on your tablet, using your own phone number (don't worry—you'll be assigned a new number after registering). For more information, check out our softModder guide to using textPlus on the Nexus 7 tablet. 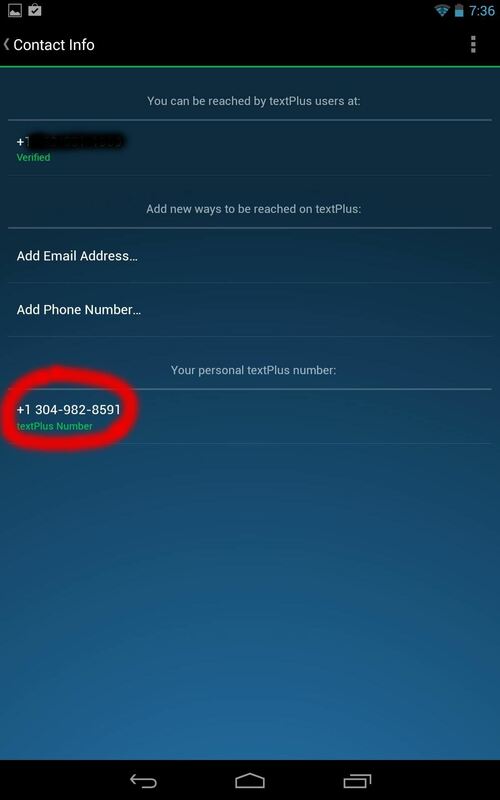 After you've installed textPlus, open the app and go to Settings -> Contact info and locate your textPlus number. 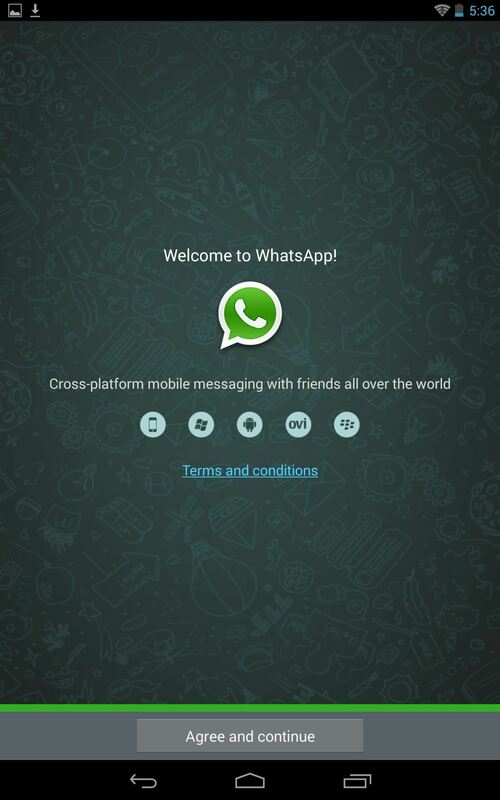 Open the WhatsApp application and you'll see the welcome screen. Click Agree and continue. 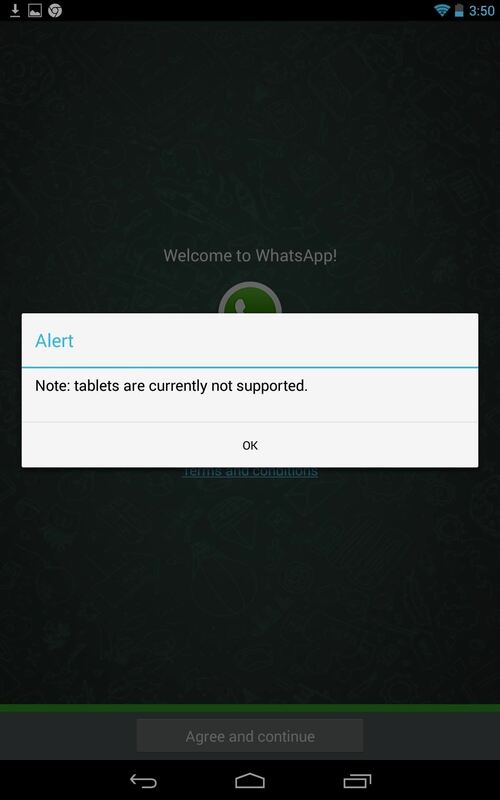 You will notice a notification saying "Note: tablets are currently not supported." Ignore it and select OK.
You will now be in the setup screen. 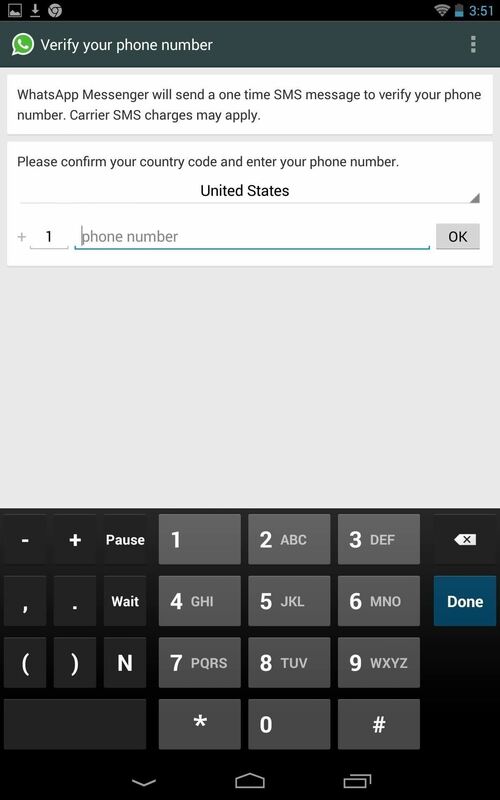 All you need to do here is select your country and input a phone number where you can receive your code via SMS text or call. Use either your real phone number or textPlus number, depending on which method you chose above. Sometimes the SMS message will fail. Don't worry, just try again or choose to receive a phone call with your code instead. Once you receive your code, type it in and you'll now be ready to enjoy chatting away with your friends. What more can you ask for? It's easy, free (initially), quick, and you don't even need a rooted device! Hopefully this was easy and straight forward for all of you. In the case that you do run in to any trouble, leave a comment and I'll make sure to try and help you out. This guide was executed with the Nexus 7 tablet, but that doesn't mean it's limited to just this tablet. This can work for most Android tablets, like the Galaxy Tab, so why not give it a try? No rooting, no risk. The Whatsapp app just crashes on loading. I was able to get to the sms verification step and also got it verified, but now every time I start the app, it crashes, says ( Unfortunately the app has stopped working ). Any ideas to get around it..?? So, I updated to 4.4 and ran through this WhatsApp set-up again, and I had no trouble at all. I used the text+ method and received my activation code. Let me know if this helps at all. i am having the same problem! please help ! I haven't updated to 4.4 yet, so I'd have to get back to you on that, but I was wondering which method you used. Did you use Text+? Also, uninstalling and redoing the procedures may work. Its crashing continuously for me as well. I got the latest build of whatsapp apk and running kitkat. Tried reinstalling several times already. That's odd. I had no issues at all after updating to KitKat. Where is it crashing? Right after I enter the vertifcat ion code. "Unfortunately, the app has stopped working"
awesome. Glad you were able to figure it out. The crash for secondary users can be fixed by allowing full access (from the primary user) to the /data/data/com.whatsapp folder (requires root). I tried this on my Nexus 7 which has android version 4.4.2. I was able to get the SMS verification done but the app just crashed after that. Now every time I try to start it, it crashes. Is there any way to get around that? I would try uninstalling and restarting. At least now you already have your phony number to easily do it again. P.S. I am not using text plus. I used my phone no. for it. Use text plus, it might work that way. Using text plus on Nexus 7 2013, it is working like a charm. Thanks for the tips. I'm glad to hear that. Enjoy! I tried it but text+ will only allow me to get a US number and Im in the UK, but anyway I got it with a US number however I cannot get past the verification stage. It sends an sms, I receive the sms but there's nowhere for me to type it in and the whats app doesnt automatically detect it either... 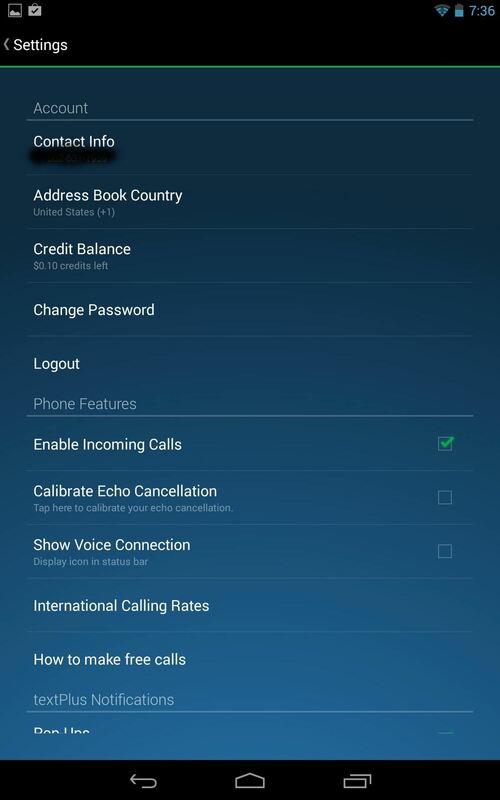 So tried the call version but I dont receive any calls either :/.... Any tips? So you're on step 4, correct? Also, go into text plus and tap on your phone number, you should be able to change once and pick location. 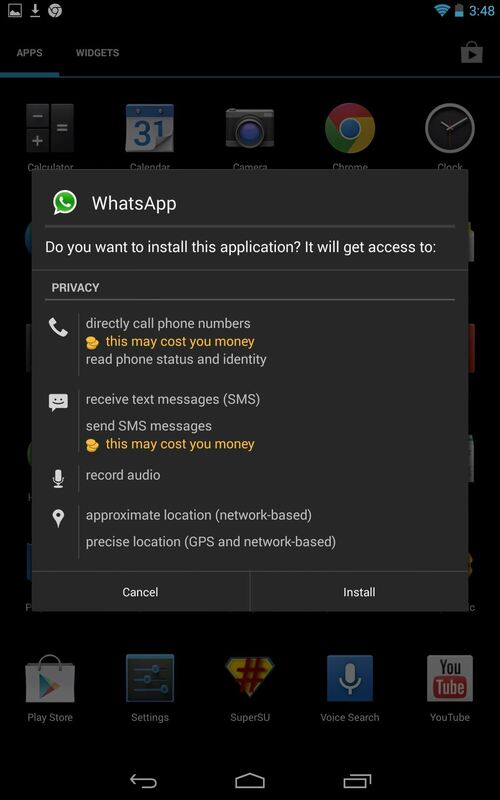 You might want to just Google an English (UK) version of the WhatsApp APK. See if that works. I love hearing when it works so well and easy. Enjoy! Hello, I am not able to download whatsapp at all. In playstore, it simply says "This version is not compatible with this device". Please help. That is why I have provided an APK. The Play Store will not allow your Nexus 7 tablet to download it, so to do so, you must click the APK link in the article above. Let me know if this works. 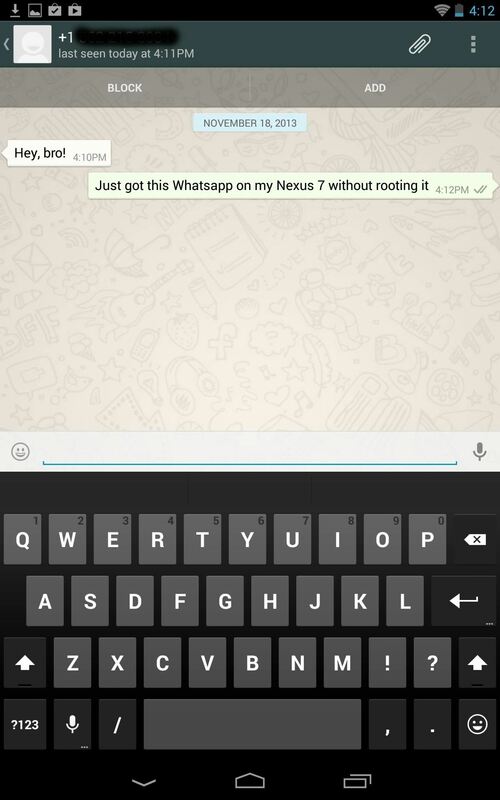 How to make WhatsApp work on second user of nexus 7 2013? Please I need serious answers and solutions. It won't work on the second user but would work on the primary user. That's highly lame. does it let you select "ok" and continue to the setup? I was using whatsapp on my nexus 7 2012 using my textplus generated number. But now after re-installling whatsapp is not able to complete the sms verification process! Help!! What exactly does it say or do? 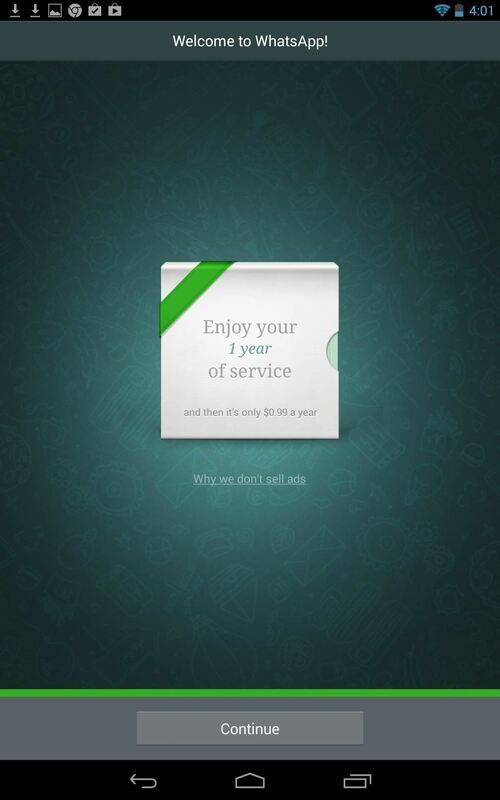 Did you use a newer version of WhatsApp? It may be an update that prevents this from being possible now. I will have to try it out again. Try the APK in this article again, and let me know how it goes. I'd used the link provided in the article, it's of a newer version I think and it's still not working. I have gone through the process in its entirety but the final step of verification is pending. 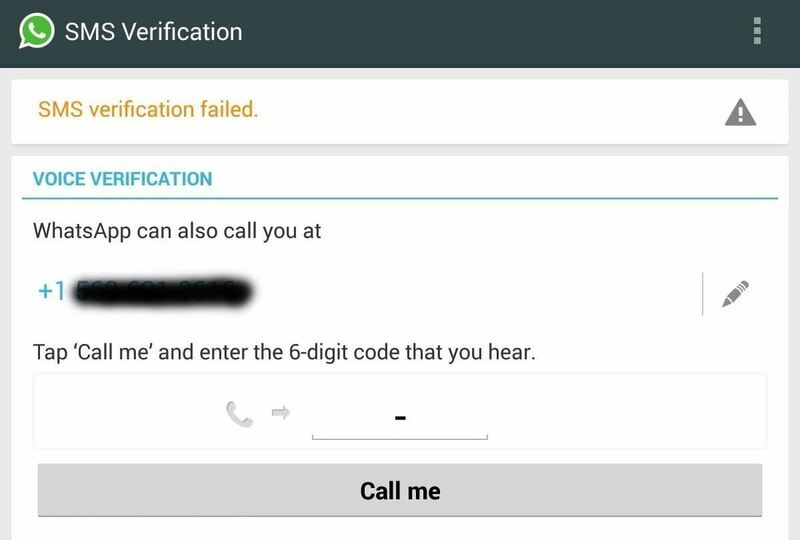 When I am trying to get the access code via voice call, the error I am getting is that "the call could not be made" and therefore need suggestion what to do. I am having a problem with using textplus because i live in south africa and a can't generate a south african number so whatsapp cant verify my number. Any ideas? Go under contact info, tap on your number, and see if you can change it there. Let me know if this works. Thank you.It was straightforward for me. hey am having the same problem. did you fix yours? am having the same problem as Ashish kumar, it does not say anything but the install button does not get selected. this might help- i had whatsapp before but it said this version is too old update it after which i deleted and am starting the process again. So it's working after the update? I've been trying for over an hr and still says SMS failed....what do I do? Where are you sending the SMS? I just need some clarification. So you put in the number and what message does it give you? Also, what number are you using? Is it a US number? Yes u.s. number that text plus gives me. 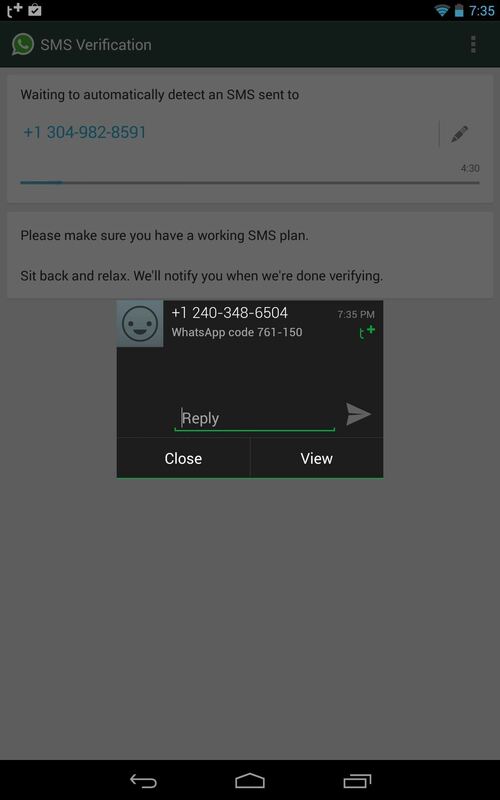 "Sms verification failed, please use voice verification" voice doesn't work either. Im currently running android 5.1.1 on my nexus 7 and i cant install the file at all. When i press install, a pop up shows up saying 'error parsing package'.. Please help me out! I installed textPLus, got a number and was informed that number was banned! Anyone else run into this? Further in whatsApp support it says it will not activate ANY VoIp numbers with no exceptions!